Wolf Hall is a play based on a book of the same name by Hilary Mantel which focuses on Thomas Cromwell and the Tudor Court. We see Cromwell’s rise to power over the period of time when Henry is in the process of attempting to divorce his fist wife Katherine of Aargon through to the marriage to Anne Boleyn and the birth of Elizabeth. It helps with this show if you are aware of and interested in Tudor history otherwise remarks risk going over heads, for example ‘I’m no one, I’m only Jane Seymour.’ Names and references to events can begin to blur however prior knowledge is not essential and Wolf Hall is still enjoyable without the full back history. A lot time is spent talking and musing over the happenings in court rather than watching it unfold and for that reason it felt slow at times. The conclusion of the show also feels anticlimactic. I appreciate that the play is part of a trio and this could give an indication of the reasoning behind that. The director, Dan Usztan, however did his best to keep the pace up. He ensured that rather than plunging into blackouts to signify a passage of time he simply maintained Cromwell’s presence on stage and he was just joined by the latest players in the next stage of the play. There is a large cast of 24 in Tower Theatre Company’s production of Wolf Hall although, as expected, Dickon Farmar gets a huge amount of time on stage as Thomas Cromwell. It took him and his fellow cast mates a while to relax into the play but once they had the show was well acted. Farmar had an authoritative air about him although at times I don’t think his manipulative undercurrents were clear enough. A change of dynamic depending on who he was around could have been more prevalent and assisted with this. Anne Boleyn was played by Sophie King and her more sullen undertones contrasted nicely with Emily Grimson’s playful Mary Boleyn. Martin Mulgrew as Henry VIII did a good job at conveying a king riddled with doubt and easily manipulated. 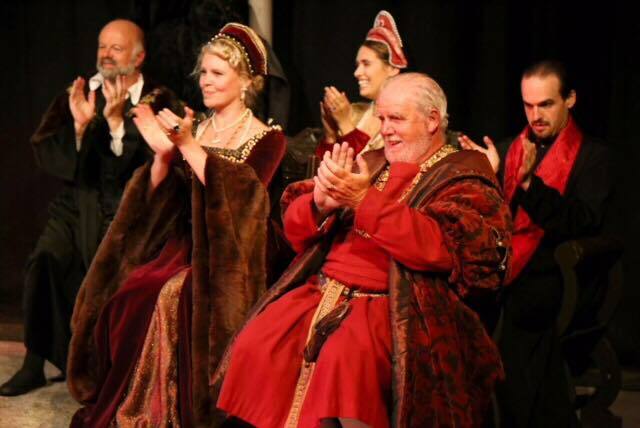 Some of the members of the council and Henry’s court did begin to merge into another but part of that was down to the writing rather than any fault of the actors. The show was costumed well by Haidee Elise, in particular the dresses for the women such as Anne Boleyn gave the right feel for the lavishness of the court. The set was also well designed by Jude Chalk with plenty of playing space allowed yet arches in the background helped set it in the lavish palaces Cromwell frequented. The sound design was also interesting with musical interjections playing at pertinent points. This could have been used further to help enhance the mood however I appreciate that this may have created a conflict with being able to hear the actors clearly, something that was not a problem at all throughout this wordy show. 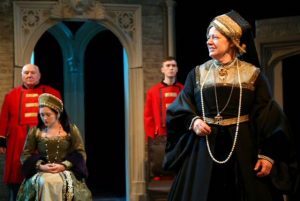 Overall Tower Theatre Company have produced a thoughtful production of Wolf Hall, which despite taking a while to settle into it’s pace is well delivered by the whole company. To find out more about Tower Theatre company visit their website. If you like this review you might also like my review of Earthquakes in London, Pippin and Dogfight also at the Bridewell.